The excitement for Disneyland is putting me on edge, I'm so frigging exciting! If I'm not working, I'm thinking about shopping, thinking about packing and just overall raring to get going. In less than 30 days I'll be on a plane and on my way to Disneyland. Being as we'll be going in the mists of winter, I'm keeping my eye out on some new warmer bits. I've already found a few things and wrote a little post, here. I'm in need of a sturdy backpack and I'm in love with this one from New Look, I'm a little concerned I'll fall out of love with the colour but I also love it at the same time. I'm in desperate need of a new leather jacket & the faux fur is very popular lately. With the faux fur, I've also noticed them online a lot more lately and the faux fur waistcoat looks so comfortable...I thank Lily Melrose blog for introducing me to them. Alongside all of those I'm on the hunt for the perfect button A-line skirt, specifically in black, I think it'll look great with some brown boots, thick tights and the leather jacket. Perfect to wear on our day in Paris. 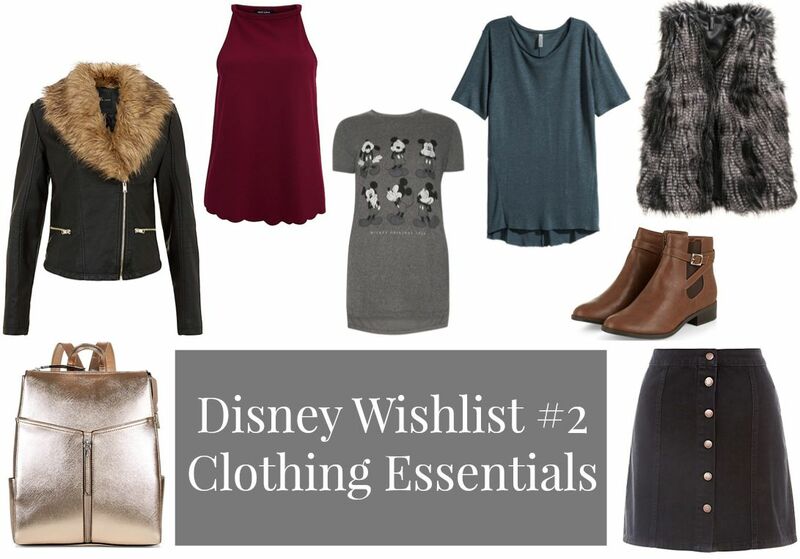 For my final few bits on the wish-list I couldn't help but look at a few more Disney tops and some more comfortable lounge wear t-shirt in darker more winter appropriate colours. Constantly counting down the days until my payday's and trying to save that little bit extra cash so I can treat myself to a few new things before going away. eeep, only 20 days to wait now!! Soooo jealous girl! You'll have the best time, especially with that wardrobe! I love the fur trimmed jacket, stunning! It's so warm and comfy too! !